File hosting has always been a great issue for both webmasters, specially to those webmasters who depends on free hosting platform like blogger. And for visitors downloading form third-party file hosting filled with unwanted and intrusive ads is a nightmare as well. So this article will guide will you on how you can host your files ads free, with direct links on GitHub.com. But remember that you are not allowed to misuse this service to spam and the upload size for each file is 25 MB, and it should be enough for most of the webmasters. If you already have a GitHub account, login to it else head to the GitHub signup page and fill up the required fields, choose free plan and input other information as it suits to you. Now you might need to verify your email before you can start using GitHub services. For demonstration purpose, i have set my username on github as 'sombex'. Create a new repository using the '+' button on the top right corner. Now give your repository a name For example my repo name will be 'myuploads'. 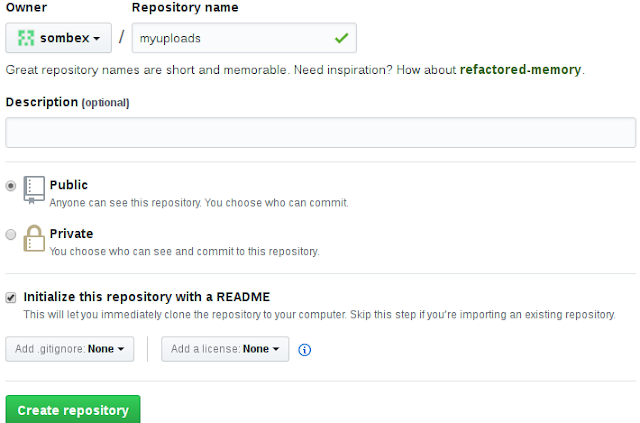 Keep the repo as public and tick on the option 'Initialize this repository with a README'. Like in the below image. After creating the repository, you will be redirected to the newly created repo. Now, on the top right side, click on 'Branch Button'. We will create a new branch, in which we will upload our files, named 'gh pages'. Just type 'gh-pages' on the text box and create it. Now remember that whenever you need to upload something, make sure that you are on the gh-pages branch. Ok now lets upload our file, but before that make sure you are on the correct branch, that is gh-pages. On the right side you will see upload files button, hit it. To upload file you have two options, drag and drop or select file from file open files dialog box. Now lets get the direct link of the the file demo.txt or something else on your case. Reminder: Keep this in mind (this is gonna be helpful to get direct link) that my username is 'sombex', my repository name is 'myuploads' and my file name is 'demo.txt'. You will have to remember yours to get the direct link of that file. What we did is made some changes to the link, like we made github.com to github.io, put our username at the beginning of the url, removed blob and gh-pages too. 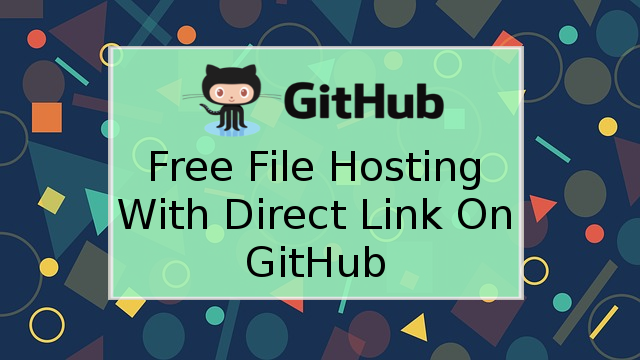 So thats it, this is how you host your files for free with direct link on GitHub. If by any means you were unable to replicate the results, please do make a comment below so i can help you. Have a good day.